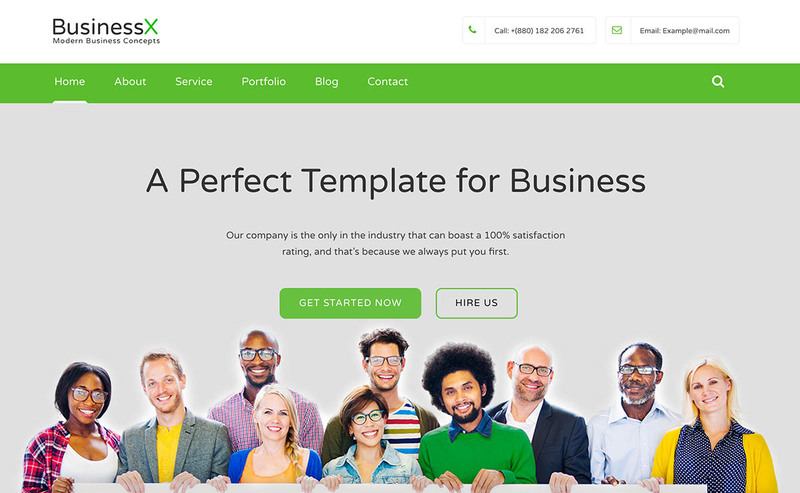 Business X is a free Bootstrap business website template brought to you by XooThemes. There're some amazing features available inside. Let's find out. Firstly, BusinessX is a free Bootstrap business website template. Consequently you can create top quality corporate and business websites and those that offer agency business. Secondly, the theme comes with a awesome unique design. As a matter of fact, we ensure you can easily design your website just how you like it. However, BusinessX is a premium quality HTML5 template. In addition, BusinessX makes it possible for you to construct any kind of website that you can imagine. Finally, the layout looks beautiful at any size, laptop screen, iPad, iPhone, Android mobile or tablets. Plus, BusinessX includes detailed document for customization options that allows you to change the visual style of any elements. 4 homepage versions: It has 4 homepage versions to make a perfect website homepage. You can easily change or modify your homepage whenever you want. This is one of the finest features any Free Bootstrap Business Website Template can ever have. 3 header version: In fact, you’re going to get three header versions with Business X. You can use three different headers option to make you web content more defined and clear. Headers can be used and modified anytime. Blog single page: Single page or one-page feature is another most amazing feature for a free Bootstrap business website template. The single page will allow you to stay in one single page which makes your work easier and comfortable. Corporate, unique Clean design: Arguably, Business X comes with a very unique and clean design. The design will definitely make the audience happy and will make them stay with on your website or blog for a longer time possible. The color combination makes the entire design much more beautiful. Scroll on fixed navbar: Fixed NavBar is a very convenient way to choose any specific option from a fixed sticky menu. Why it’s convenient? Well, you can choose any option by scrolling up and down. The fixed NavBar is easily movable. Portfolio grid with popup: To make your audience attracted, you need to show off your portfolios. So, how can you show you portfolio? There is a grid system to show all the portfolios with popup. It makes your portfolio grid look awesome. This is very helpful to for anyone who will love to show your works before they decide to work with you. CSS3 Animation: CSS3 animation make your website look interesting. CSS3 animation is something when an element changes the style from shape to another gradually. You can change the animation whenever you want. Easy color management: This is a very important part in any free Bootstrap business website template. The color combination makes this template much attractive. The best part of this template is its color management option. You can change or modify the color scheme whenever you want. There’re large number of color schemes available. Fully responsive for any device: The template is absolutely mobile device and desktop friendly. Therefore, Business X is completely responsive for any device possible. iPad and iPhone friendly: It is a mobile device friendly. As a matter of fact, the template is also iPad and iPhone friendly. Therefore, the template is very user-friendly. Full browsers compatibility: This template comes with cross browser compatibility. As a result, this template is compatible in any browser available. No doubt this template is an amazing for a reason. Google map & Google fonts: The following template come with Google map and also with Google fonts. Google fonts are very helpful. Working contact form with ajax: The template has a very fine and fast working contact form with ajax in addition. Clean commented code & optimized CSS: There are short codes and all codes are clean and well commented. The codes are also optimized at the same time. Font awesome icons: Font Awesome icons are a set of icons. You can use any of these icons. Well detailed documented and many More. Finally, Business X is a perfect free Bootstrap business website template for your web or blog. Anyone who’s looking for a well-designed web template, this can be an ideal choice. However, this template is not only for the business purpose, but also for personal blog. In other words, the template is very flexible. On the other hand, the template is nicely-designed and colorful at the same time.